By continuing to use the website, you hereby agree. Wege ins Ausland für alle! The ESF project “your way: make it in Hamburg” is aimed at foreign workers, university graduates and apprentices who want to live and work in Hamburg, as well as refugees with professional qualifications and good prospects of staying. “your way: make it in Hamburg” is also aimed at businesses that are looking for highly skilled specialist personnel. The aim is to bring these businesses into contact with skilled workers from abroad and promote a comprehensive culture of welcome. The project team provides support in searching for jobs, making contact with employers in Hamburg and in issues relating to careers. As well as integrating skilled workers into the employment market, “your way: make it in Hamburg” also promotes complete integration into everyday life. “your way: make it in Hamburg” also provides individual support in putting together application documents or preparing for interviews, as well as telephone and application training in small groups. All information and seminars are provided free of charge. “your way: make it in Hamburg” is an Arbeit und Leben Hamburg project in cooperation with the contact point W.I.R. (work and integration for refugees), the Hamburg Welcome Center the Zentralen Anlaufstelle Anerkennung (ZAA) (central contact centre for recognition) and the Servicestelle Arbeitnehmerfreizügigkeit (service centre for the free movement of workers). 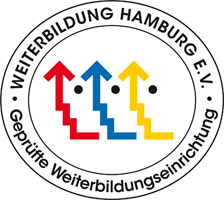 It is funded by the Free and Hanseatic City of Hamburg and the European Social Fund (ESF). If you would like more information, please feel free to arrange an appointment with us. Meetings can be in German, English, French or Spanish. Location: Seminars take place at: Arbeit und Leben Hamburg, Besenbinderhof 60, Hamburg.